Send a lively and colourful compact flower arrangement consisting of multi-coloured Gerberas and greenery, to anyone who needs extra love and attention. This superb little flowering arrangement makes a bold and vibrant statement saying, “be happy”, in its own little pleasurable way.Make your recipient extra happy by adding a Standard Box of Chocolates to your order and you can be sure to be popular for a long, long time! My sister-in-law loved the flowers I sent they arrived early morning as I requested what more can you ask. Plus the fact when I ordered I received a discount which was nice. The balloon added the final touch which was passed on to Scarlett the youngest member of the family. 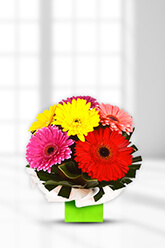 An excellent service with very good quality flowers. Easy with ordering and delivery guy was thoughtful and caring. Mum loved the flowers. Just too many emails suggesting I take advantage of sending flowers again from the details of previous order. Simple website to navigate & order delivered on time for my friends birthday. She loved them - thank you ? ?